Each frozen drink machine rental comes with decorated tiki cart and skirt, 80 cups and 80 straws, our mix services 80-8 oz. drinks and are $20 each. Choose from a wide variety of flavor mixes Perfect choice for kid, adult party or wedding. Serve with or without alcohol.No ice needed, No mess. Bartenders, party chefs,and servers available upon request. THIS ELECTRONIC EQUIPTMENT MUST BE COVERED AT ALL TIMES UNDER TENT OR PLASTIC BAG TO PROTECT FROM WATER DAMAGE. SEE CONTRACT OR F&Q PAGE FOR COMPANY POLICIES. Non-alcohol mix will take approx. 30-60 min. to freeze. Alcohol mix will take approx 60-90 min. to freeze.YOU MUST HAVE ALCOHOL IN FREEZER AND MIX IN FRIDGE OVER NIGHT FOR THE ALCOHOL TO FREEZE IN MACHINE. THIS WORK BEST IF 2 BOWL MACHINE IS INDOORS NOT OUT DOORS. FOR OUTDOOR USE USE BLACK COOLER BAG PROVIDED. Once one chamber is empty it takes approx. 60-90 minutes for machine to freeze second batch FOR BEST RESULTS ADD MORE MIX WHEN THERE IS STILL ICE IN BOWL.. Only use cold water and mix, keep in shaded area. 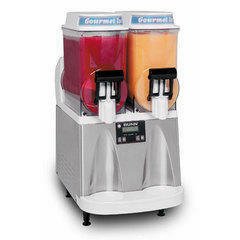 THIS TYPE OF MACHINE WORKS BEST IF YOU Add alcohol after product is frozen. On really hot days mix will not freeze if alcohol is used into machine . With all 2 bowl machines it's better to just make non alcoholic drinks and pour alcohol on top of slushy when it is in cup. KEEP MACHINE IN SHADED AREA, IF AREA SUNNY TRY RENTING ONE BOWL MACHINE THEY ARE INSULATED AND WORK IN DIRECT SUNLIGHT. OUR ONE BOWL MACHINES WORK FINE IN DIRECT SUNLIGHT AND OUTDOORS BECASUSE THEY ARE INSULATED AND THE 2 BOWL MACHINES ARE CLEAR PLASTIC BOWLS.